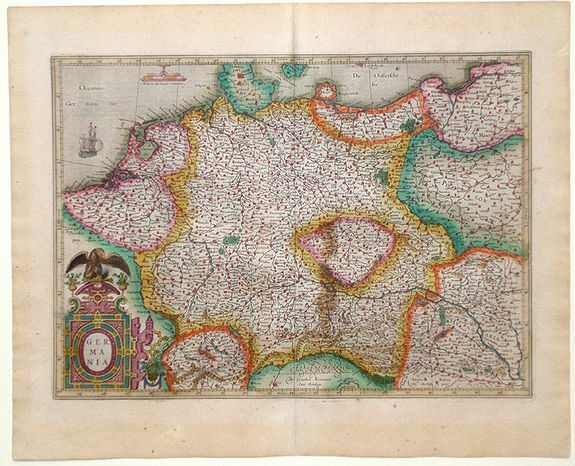 Map maker : MERCATOR, G.
Size : 18.7 x 22.5 inches. / 47.6 x 57.2 cm. Description :Colorful map of Germany and surrounding areas including The Low Counties, Luxembourg, Switzerland, Hungary, Poland and Prussia, from the Mercator/Hondius atlas. Major cities throughout the regions are highlighted in red and each country is delineated with bands of color. Condition : Light staining and foxing around the margins and light wrinkling around the edges. Evidence of previous repair to the central crease. Excellent oxidation of copper in the green pigment.